Following the good tradition, also in 2012 there was the Christmas Quempas singing in the church of Bad Cannstatt. The entire revenue of EUR 7,068 from ticket sales was donated to the children of Primavera. We'd like to thank all visitors! Buy it, sell it, love it! The Do-it-Yourself community "1-2-do.com" powered by Bosch - is a community of nearly 50,000 members meanwhile with one common hobby: home improvement, crafts, decorating. In summer 2012, the community came up with the idea, to create an artwork together for the good cause. Since August, 10 handymen screwed and tinkered at a common Christmas crib, added ideas and put their heart and soul into it. Carefully packed, the growing artwork was sent across the country, so another member could continue working. Closely followed, motivated and cheered by a whole community, this gorgeous alpine Christmas crib was created in bits and pieces! Now, this beautiful crib was auctioned for 302 EUR for charity projects on eBay..
Pre-Christmas atmosphere with the "BOJO"
Also this year, the JMP'ler have invited to the pre-Christmas concerts, and everything was organized perfectly. The 200 guests were greeted warmly and Helmut Schwarz (Vice Chairman) informed about the objectives of Primavera. Under the leadership of Sepp Herzog, the musical evening began with Christmas songs like "First Noel". After another well-known songs, the solo singer Miriam Angstmann followed with her fantastic voice and wowed the audience with songs like "A Night Like This". As a surprise, St Nicholas made a visit as well. With contemplative words he addressed the guests and reminded of the need of good deeds. After the break, we went on swinging, where also the comedian Fabian D. Schwarz presented his little "Year in Review" as a cheerful contribution. With the Christmas Swing title "Do not Get Around Much Anymore" Bojo said goodbye. The audience was enthusiastic and encouraged the band for two further encores. Thus, a very beautiful musical evening came to an end. The generosity of the guests was enormous and thus 4,533 EUR can be paid into the Primavera account in total. We say Thank You to the orchestra and all the organizers! We say thank you very much for the time and creativity of each individual craftsman! Tapping beer, waiting tables and washing dishes at the Hofbräu festival! For the fifth time they sayed: Roll up your sleeves and go! Tapping beer, waiting tables, washing dishes and tackle, where it's needed. For one day, the Bosch trainees worked at the Stuttgarter Hofbräu, without getting wages. The work has paid off! This year, even 2,700 EUR came together that were donated for children in need. Many thanks to all the organizers, especially to the organizers Beate Bayer, Julia Stöcker, Michael Hörig and Fabian Blau. Afterwork Lounge for the good cause. At the first "Primavera Afterwork Lounge" in the Bosch house Heidehof in Stuttgart, 200 young Bosch associates and friends were invited to enjoy the end of the working day, catch up with colleagues and enjoy drinks at the "BPS" cocktail bar. At this successful evening a total amount of 3,450 EUR was gathered and donated completely to "Primavera - Aid for children in need". Also this year there was a Primavera summer festival with lots of attractions, shows and competitions for all ages again. Also guided tours through the former home of Robert Bosch were offered and at the small market you could acquire a lot of pretty things. The proceeds of this year's event was particularly pleasing with EUR 10,450! Read more in our Event Details. A total of 612 Bosch employess from the Stuttgart area joined the this year's 5.DEE companies run. 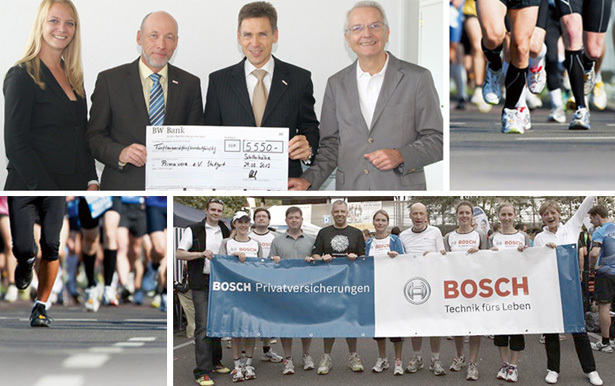 For each of the runners, the Bosch Private Insurance donated 9 EUR to the charity Primavera - thus a total of 5,500 EUR can be used to help children of our projects. At best running weather, the participants met at the Bosch meeting point, which was organized by Bosch BKK, KSF and Bosch Private Insurance. In addition to blood pressure measurement, free drinks, the obligatory "Bosch anchor biscuits" were provided and other give-aways could be taken as a souvenir. Congratulations to the best female runner Karina Hoffman (time 26:32) and the best male runner Daniel Hummel (time 19:28) and thanks to all participants! More information and photos will be available soon at: www.bosch-privatversicherungen.de. 130 musicians in line with Power Tools from Bosch. 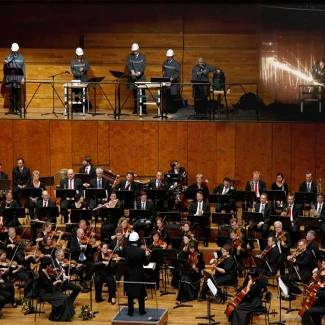 The concert of the Symphony Orchestra of Bosch and SAP on 14 July in Stuttgart was in the truest sense of the word an extraordinary event of the highest class. A night at the museum - open-end! EUR 1,700 were raised at the raffle for the benefit of Primavera.